So a Chevy Equinox and a Honda CR-V walk into a bar drive into a garage and pop their liftgates. 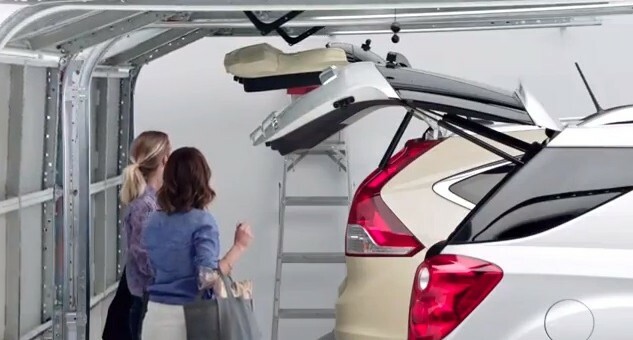 When the garage door closes, the CR-V’s liftgate gets all scratched up, while that of the Equinox doesn’t. Why? Because the Equinox has an available height-programmable power liftgate, while the Honda doesn’t even offer one — that’s why. The punchline is then followed by this tagline: “that’s American ingenuity to Find New Roads“. What an awesome ad. It’s simple, entertaining and direct, while showing the clear advantage of the Equinox. Plus, the tagline in the end is the perfect close to the commercial, which makes us think that Find New Roads is starting to work… wouldn’t you say? If i had a quarter for every time that happened to me! Cool feature to be sure, way to go GM. Now if owners just remember to make sure the setting on the knob is right first every thing will be just fine. That’s very smart. I take it that they offer this same system on the Terrain and SRX? This has been a standard feature on all the power doors since this body style came out. I did not really think about it till we got our Terrain home and wondered if it would clear. No problem but it is nice to have the feature. Not to take away from the ad but it is a bit bogus. Those garage doors are way shorter than normal. My Enclave would not fit thru them. Well, yes… but fact remains that the Equinox has the adjustable liftgate, while the competition doesn’t. Don’t think Honda even has power tailgates. Nuff said. Very nice! My Equinox is a 2009 model, so I missed having that feature by six months! Good idea, I’m guessing its not a available in Europe would be a great addition to the Mokka, Meriva, Zafira, Zafira Tourer, Antara, Orlando & Captiva. That impressed I watched the advert twice. Not only is it useful for low garage doors it would be useful in a multi storey car park or for short or disabled people for ease of lifting, an excellent feature that sells itself and most probably (if its a deal clincher) the car. Um, not to rain on your parade, but who has a garage that is so deep you can leave the tail gate open with out the door crashing down on it, no matter how high the tailgate is? Seems like an american car company selling another useless feature. Great marketing on a useless gadget. I do! My garage is nine feet tall and twenty feet deep, all concrete. Any SUV can fit and open its rear gate without crashing. But I have a Chevy Equinox already!